Varanus melinus is a member of Indicus species group. Males are larger than females, have heavier body builds and more pronounced bulging facial features. Coloration is mostly yellow mixed with black in honeycomb-like pattern. Yellow is more dominant on the head and neck and gets darker closer to the end of the body. Varanus melinus are very aquatic. Their tails are muscular at base and laterally compressed to aid them in swimming. While swimming, their front and hind legs are compressed along the body and movement is only achieved by using the tail as propellant. As an enclosure to grow them up in I would start with a 1 x 0.5 x 1 meters (3.2 x 1.6 x 3.2 feet) enclosure, and then 0.5 x 0.5 x 0.3 meters (1.6 x 1.6 x 1 feet) of soil on the bottom, and 0.5 x 0.5 x 0.3 meters (1.6 x 1.6 x 1 feet) water. A deep dry area will be appreciated as they will burrow also, and the water where they swim in or sleep. As they get bigger the enclosure has to grow with them, they always need to have a swim area where they can be submerged fully in full body length, and need to have the possibility to bask and hide in full body length. For adults you should be going for a 2 x 1 x 2 meters (6.5 x 3.2 x 6.5 feet) enclosure and bigger is always better. My personal plan is to go for a 1000 liter water area when they are adult. More detailed information can be found on varanusmelinus.com. I use cork and hollow bark as hide spot, just provide enough for every individual, and everything will be fine. Very important component of humidity retention. Thick (1 ft and up) and properly moist (not damp) substrate layer will hold and slowly release humidity over prolonged period of time. Once in awhile will need to be remoistened, either manually or automatically. Another important function of thick substrate layer is promoting digging and burrowing activity and temperature retention: the larger the substrate volume – the longer it will hold necessary temperature, so can help in case of power outages. One of the best and economically effective substrate layers is organic topsoil premixed with sand 80 to 20 ratio. For lighting, you should use high output UVB bulbs like HID UVB bulbs, these give heat and UVB from one source, make sure the animal has enough bulbs to get heated over its full body length. My basking temps are 50-55 ºC (122-130 ºF), and are used a lot. Coolest spots in the day are around 26 ºC (79 ºF), the rest is in between that and the basking temp. Night temp is around 27-30 ºC (80-86 ºF) depends a bit of the outside temp. Water and substrate are always around the 25-26 ºC (77-79 ºF) at night, it keeps the rest of the enclosure on a decent temp at night. Fresh water should be provided daily for drinking. Providing moving water helps maintain humidity and (in my experience) encourages your melinus to drink on a regular basis. Also, providing a water dish or a separate “bath” area large enough as mentioned in the enclosure setup for your melinus to immerse themselves and swim in. You can see an example of V. melinus underwater activity from Benjamin Koekoek. My water temp is at a constant 25 ºC (77 ºF); I use this temp because it won’t evaporate so fast that it’s a condensed, but it evaporates fast enough to keep humidity up. Humidity on tropical Indonesian islands is uniform throughout the year and mostly fluctuates within 75% to 85% range. This is what we are going to reproduce in our enclosure. As for feeding, my opinion, don’t use human consumption meat, use wild and vary as much as you can with meat, fish, crayfish, mice, rats, meatmixes, other reptiles, etc.All food items should be appropriately sized and smaller than V. melinus skull opening. Monitor should be able to consume food items in mere seconds and shouldn’t struggle with them. It is better to feed smaller portions but more frequently, versus large portions once in awhile. Monitor should not be allowed to gorge itself on food and they should not be visibly full after eating. All food items have to be fed in moderation and no preference should be given to one food only. Variety and Whole Prey is crucial to prevent any nutritional and mineral disbalance or deficiency. Melinus is considered as a mild species, they are but at this moment i know more skittish and afraid melinus than outgoing melinus. First thing we need to do when we get our monitor is put it into permanent enclosure and leave alone for a few weeks with no interaction at all. Monitors are very territorial and need time to get used to their new environment and feel safe in it. Patience and good observation skills is what needed the most. Month after month of this daily interaction monitor can be introduced to bigger and bigger areas. Would be shy and flighty at first in an unknown space, but will get used to it and start exploring fast until all your living quarters are his territory. Bioactive setup is the way I follow. I now have my enclosure running for 1,5 year and never cleaned because it is bio active with isopods, millipedes, beetles and springtails. Monitors don’t shed like snakes (all in one piece). Oftentimes, one part of their body will start shedding before another. Make sure they are well hydrated and, if needed, provide them an extra bath in order to assist the shedding process. Failure to provide necessarily high-temp basking area and proper ambient temperatures range will lead to low activity, lethargy, stunted growth, low muscle tone, metabolic issues, digestive issues up to an impaction, weak immune system, respiratory infections and other connected health problems. Failure to provide necessary humidity levels will lead to various health complications. It will cause problems with shedding, down to the point when stuck unshed skin prevents blood flow and animal may lose toe, tail or limb. 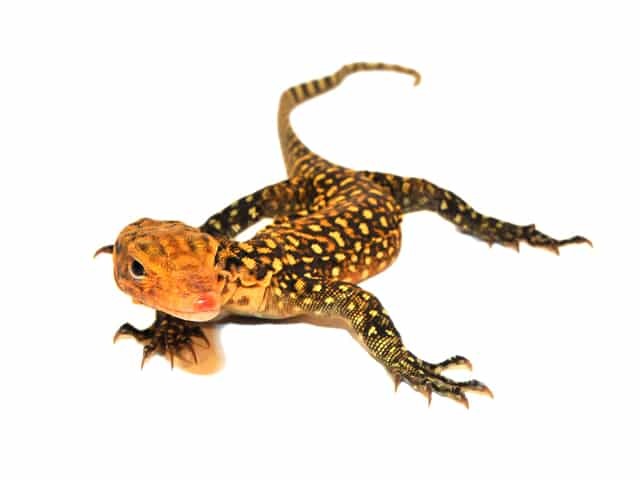 Also, since monitor lizards don’t have sweat glands and pores, dehydrated monitor would not be able to properly excrete toxic products of metabolism from it’s body and can develop gout and related health issues. Constipation and impaction are another dangerous health risks of improperly low humidity.